Who Wants to Hear Some (Instagram) Stories? “Storytelling’ has been a key buzzword of the marketing world for decades (see the philosophy espoused by Don Draper in AMC’s Mad Men), but the digital realm especially has taken this concept to new heights. Before you even introduce your product or service, your audience of potential customers want to be captivated and intrigued. Given that we see anywhere from 4,000 to 10,000 advertisements per day on a variety of platforms (print, billboard, television, internet and smartphone apps), the ads that capture our attention are the ones that truly stand out and act as a natural complement to the content with which we already love to engage. In August 2016, Instagram launched the Stories component of its photo and video-sharing app. Admittedly copied from Snapchat’s enormously popular Stories feature, Instagram Stories allow users to post full-screen vertical images/videos that disappear within 24 hours. However, while users’ normal posts can be easily lost in the timeline, the Stories feature is located at the top of the home screen, allows for a seamless scrolling with posts often appearing in chronological order and alerts users to any time a profile they follow has posted a story. 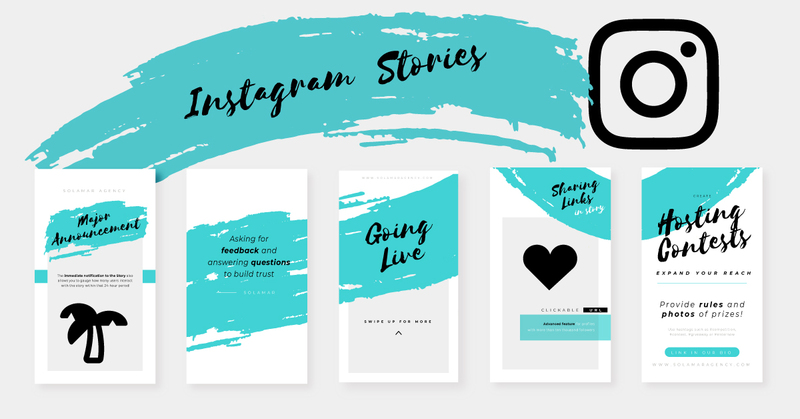 According to Instagram, over 500 million accounts use Stories every day whether posting or just scrolling through and that “one-third of the most viewed stories come from businesses, and one in five stories gets a direct message from its viewers.” If you want to truly up your company’s Instagram strategy, read on to discover FIVE ways to best use Instagram Stories. Even if you have already planned to roll out your latest product, service or event with a new website landing page, email blast and social posts on your Facebook, Twitter, LinkedIn and Instagram feeds, take the extra step to also create an announcement specifically tailored to Instagram Stories. The immediate notification to the Story also allows you to gauge how many users interact with the story within that 24-hour period. Side note: While you can use the Stories feature for announcing the finished product, you can also provide a more informal and lighthearted approach to the content with some behind-the-scenes videos of your company’s culture as they work on various product/service updates. While most websites have a FAQ page somewhere in the header or footer, Instagram Stories allows businesses to create embedded forms that let your followers ask questions through the Question Stickers or participate in polls that show predetermined responses or blank lines that can be filled in with customer feedback. People love brands that they can trust and what better way to exemplify that trust than by allowing your followers to feel like they are impacting the direction of the brand. Instagram was built on the fact that its users are posting snapshots of their lives in the moment. With that philosophy, using the Instagram Live feature of Stories can only help your business join the conversation in new and exciting ways. The options for using Live are endless, but most companies use it to unveil new products or features, document events, film interviews, hold Q&As with their followers or offer limited-time discounts. Your reach with Live on Stories can be exponential if your video gets picked up for “Top Live” on the Explore page. Unfortunately, this feature of Stories is only for profiles with more than ten thousand followers, but it is a key component of expanding your reach. As you may know, clickable links for regular Instagram posts are mostly nonexistent with the only caveat being the “link in bio” approach. And of course this means that you have to change out the bio link every time you make a new post, which can be time-consuming. Instagram Stories allows larger profiles that lets users respond to specific calls to action (Shop Now, Start Free Trial, Book Today). By swiping up, users will be able to access a browser within Instagram that displays your company’s website and landing pages. Everyone loves a chance to win, so why not give the people what they want by running a contest through Instagram Stories? Within your post, be sure to provide a photograph or video of the prize and include very specific rules on how to enter (the easiest way is to have entrants reply with their email address or profile link if they have public Direct Messages). Since Stories only last 24 hours, you can create a sense of urgency for getting in entries on time. To expand your reach and get more people to participate, use hashtags such as #competition, #contest, #giveaway or #enternow. We hope these tips will be helpful as your company starts to use Instagram Stories to boost your business engagement. As with all things marketing and social media, be willing to experiment a lot to find out which approach works for you!